Price Per Foot, 100 feet online min. Call for availability of lesser quantity. Select Daburn Part Number 2355-1/40 2355-1/32 2355-3/64 2355-3/64A 2355-1/16 2355-3/32 2355-3/32A 2355-7/64 2355-1/8 2355-5/32 2355-3/16 2355-1/4 2355-1/4A 2355-9/32 2355-3/8 2355-3/8A 2355-3/8B 2355-1/2 2355-1/2A 2355-5/8 2355-5/8A 2355-5/8B 2355-3/4 2355-3/4A 2355-3/4B 2355-3/4C 2355-25/32 2355-7/8A 2355-7/8B 2355-15/16 2355-15/16A 2355-1" 2355-1A 2355-1B 2355-1 1/4" 2355-1 3/8" 2355-1 3/8A 2355-1 3/8B 2355-1 1/2 2355-1 1/2A 2355-1 5/8 2355-1 5/8A 2355-1 3/4" 2355-2 2355-2A 2355-2 1/4" 2355-2 3/8" 2355-2 1/2" 2355-3"
Tinned copper shielding flat braid manufactured round per Mil Spec QQ-B-575 and A-A-59569. 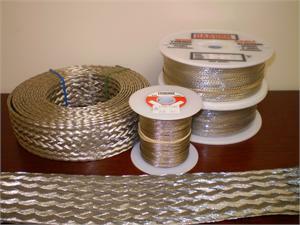 Useful as battery grounding, bonding strap for aircraft, vehicles, marine equipment. Eliminates ignition interference. Woven tinned copper with strands meeting ASTM-B-33. This series is RoHS compliant. ** These sizes are manufactured to standards of QQ-B-575 and/or A-A-59569 although they are not listed in the specification. Standard Spool Put-Up: 100 Ft., 500 Ft., 1000 Ft. Please call for less than 100 feet. * Values based on copper in free air at 65°F and intended as a guide only. Additional constructions made to order. 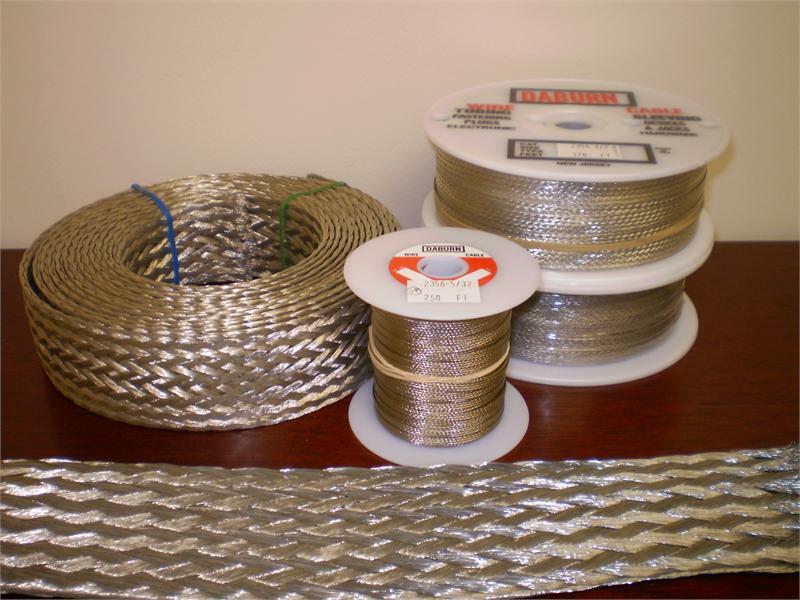 Also available in silver plated copper, bare copper, nickel plated copper and oval braided copper.